A game of Tetris was a great way to pass the time back in the 80s or 90s, when handheld consoles appeared which had them loaded up and ready to play, wherever you were. 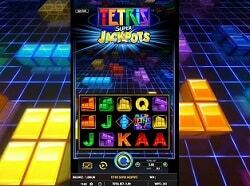 Tetris Super Jackpots is the online slot that WMS built based on this classic arcade game. They managed to do a great job with it, making sure that the building blocks that were used in the original game are also part of the bonus features and the background graphics of this one. Checking out the reels will reveal that the symbols used on it are split between the playing cards which are used in so many slot machines, and the Tetris like blocks of different colors and shapes, though only some of the original ones were used. It’s not a game with a great design, but for something related to Tetris, it has just the right look, only more colorful. Williams Interactive, or WMS as it is usually referred to, is a developer that has been working in the gambling industry for a lot of years. They have both online and offline components to their business, and they are present in countries from all over the world, from United States, to Spain, Mexico, UK, Argentina, Netherlands, Austria, China, India, Canada and Australia. As far as their games go, a lot of them will have good features, but I’m often disappointed in their graphics. When you check out the bottom right corner, you can see there a setting marked Total Bet. It does what it promises, allowing you to pick the value of the wager which is going to be used for its ways to win. You start off from the minimum possible of $0.50, and you can increase the value up to $100. A game which has 5×3 reels will have 243 ways to win, if this method of forming combinations is chosen. There are certain features inside which take a bit getting used to, since they’re unique, but it’s not a difficult game to master. While playing this game, you may find yourself with an activated Tetriminio Feature, which will place special symbols on or above your reels. These will be Tetris shaped pieces, one of seven possible versions used and coming in random positions. The positions which the Tetriminions cover will be transformed into other Tetris inspired symbols, one of the five which are used in the game. A Tetris Logo is another one that’s good to get on the reels. Though it appears only on the three middle columns, once you get all three you can trigger a bonus feature which gives you free spins. The free spins are played with 5×8 reels, so there are a lot more chances to get wins from them. The Tetriminio watermarks appear and drop to the bottom of the game area, and they keep building up during each winning spin. Once the watermarks get to the top of the screen, the feature is over. A row will clear if it gets two or more watermarks to cover it entirely, just like in the original Tetris game. The regular wins of this slot aren’t very impressive, reaching $300 cash, but the game also has those Super Jackpots which the title mentions, which can have values of $250,000 (Major), $25,000 (Minor) and $5,000 (Mini). Tetris Super Jackpots can be an exciting slot machine for a fan of the original game, especially the way WMS designed it, with features that are inspired by it.